1964 begun with an unresolved dispute between the National League and Provincial League bosses, with the prospect of amalgamation firmly on the horizon. It was the last season before the formation of the British League, but for Cradley it ended another position lower in the table than the previous year. Eric Hockaday was signed from Stoke and Glyn Chandler from St Austell, the former proving to be the better acquisition of the pair. Alan Totney started in flying form, continuing his sound progress but Derek Timms struggled to settle into the scoring groove, and was eventually forced to share his reserve berth with Ron Cooper, Fred Priest and Frank Holmes. 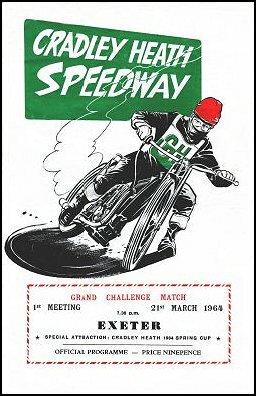 John Hart rode well as heatleader, Welshman Ivor Hughes forced his way into the lower end of the team and Harry Bastable tried his best to retire throughout the season, but was continually called upon to cover for absent team-mates. The late addition of Coventry junior Matt Mattocks yielded little return. The season quickly deteriorated into an injury-ravaged campaign, affecting the team from top to bottom and rarely allowing the Heathens to field a full strength line-up. One shrewd acquisition helped enormously to stop the year from slipping away completely though; George Major was snapped up from the fringe of the Norwich squad and turned into a significant scorer. 1964 was the year that Ivor Brown’s personal battle with Ivan Mauger eventually boiled over. The pair had battled for the status of top dog in the Provincial League and they developed a niggling rivalry. 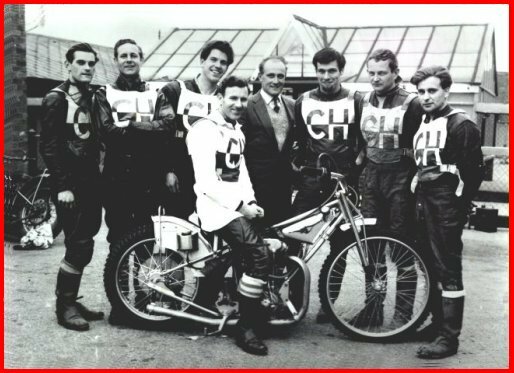 When Cradley visited Newcastle in June, first Mauger ended up almost in the fence and then the Kiwi took his revenge by forcing Brown one step further, and subsequently all the way to hospital with a badly gashed foot. Their feud continued throughout the season, even involving fisticuffs in the Dudley Wood pits, but the upshot was that Cradley lost their number one for a sizeable chunk of fixtures. Johnny Edwards missed most of the season through injury as well as a temporary switch to Wimbledon , and as the injuries and departures took their toll, the Heathens were soundly beaten on their travels like never before. They went down 60-18 at Exeter , failing to even win a race, and then 50-28 two nights later at Poole . When Glasgow visited the Wood for the final league match of the season, it was to decide who would end up with the wooden spoon. A six-point home victory was inspired by a return to form for both Hart and Totney, and it gave the side a confidence boost ahead of a second successive Knock Out Cup Final. This time it was a step too far as Ivor Brown’s 15-point maximum couldn’t prevent a two-point aggregate defeat. Reaching the final had been an accomplishment, but 10th place in the league from 12 teams meant another disappointing end for the club. statistics taken from the Cradley Speedway database for PL matches only.